What do the Scriptures claim for themselves? That’s John Piper’s question in the next few chapters. In chapter 5 he asks the question of the Old Testament. Piper wants us to know that he’s not claiming the Scriptures are true simply because they claim to be. At the same time he’s not denying the importance of what God himself says about his Word. “I will argue that those truth claims are threads in a tapestry whose divine glory is self-authenticating” (Piper, p. 90). But in this chapter and the immediately following, he wants us to see those threads as clearly as possible. The writers were aware God was speaking to and through them, but they never commented on the Old Testament from outside the whole. Instead, they were actors on the stage God was directing. The writers tell us “about the way God was revealing himself to them and to others through them” (Piper, p. 91). Piper alludes to God’s greatness in holding galaxies in place and calling billions of stars by name (Isaiah 40:26)—and that he condescends to speak to us. It’s astonishing, Piper muses, that God wills to speak to us in human language. When he speaks, he speaks to humans directly . . .
“Now the LORD said to Abram, ‘Go from your country and your kindred and your father’s house to the land that I will show you’” (Genesis 12:1). “God spoke all these words, saying, ‘I am the LORD your God, who brought you out of the land of Egypt, out of the house of slavery’” (Exodus 20:1,2). The Scripture never explains how God speaks. Furthermore, notes Piper, it’s doubtful that we could make sense of his “explanation”. This has led some to be skeptical that God actually speaks at all. Rather, they see God communicating through events. But, the late James Barr (Scottish Old Testament scholar) protested: “If we persist in saying that the direct, specific communication must be subsumed under revelation through events in history and taken as subsidiary interpretation of the latter, I shall say that we are abandoning the Bible’s own interpretation of the matter for another which is apologetically more comfortable” (Piper, p. 92). Example: God said to the prophet Nathan, “Go and tell my servant David, ‘Thus says the LORD: Would you build me a house to dwell in?’” (2 Samuel 7:5). Example: God said to Isaiah, “Go and say to Hezekiah, ‘Thus says the LORD, the God of David your father: I have heard your prayer; I have seen your tears; behold, I will add fifteen years to your life’” (Isaiah 38:5). Instead of speaking directly to David and Hezekiah, the LORD speaks to them through a prophet. Again and again he does this. However, the words remain the very words of God . . .
“You shall speak my words to them whether they hear or refuse to hear, for they are a rebellious house” (Ezekiel 2:7). They are God’s words because God directs the prophet’s speaking so his mouth is like God’s. We see this ideal in the prophecy of the ideal prophet to come . . .
“I will raise up for them a prophet like you from among their brothers. And I will put my words in his mouth, and he shall speak to them all that I command him” (Deuteronomy 18:18). Often in this connection between God’s words and the prophet’s words, the prophet speaks in first person singular as if God himself were present speaking in person . . .
“I am the LORD, and there is no other; besides me there is no God” (Isaiah 45:5). “The Old Testament is saturated with the explicit claim that our Creator and Sustainer and Redeemer is actually speaking intelligibly to the world he has made” (Piper, p. 94). “Thus says the LORD” occurs 417 times and the phrase “declares the LORD” occurs 358 times in the Old Testament. Stunning. Equally stunning: that the eternal, infinite Creator actually speaks in a way mere creatures can understand. He says to Moses, “Write this as a memorial in a book . . . “ (Exodus 17:14). Again: “Write these words, for in accordance with these words I have made a covenant with you and with Israel” (Exodus 34:17). Similarly, the prophetic books begin by indicating they are a composition of the prophet’s revelations from God . . .
“The words of Jeremiah, the son of Hilkiah, one of the priests who were in Anathoth in the land of Benjamin, to whom the word of the LORD came in the days of Josiah . . . “ (Jeremiah 1:1). . . “The word of the LORD that came to Micah of Moresheth in the days of Jotham, Ahaz, and Hezekiah, kings of Judah . . . “ (Micah 1:1). “What emerges from this survey of the Old Testament’s self-attestation is a culture in Israel that know itself confronted by God through his all-authoritative word, which comes not directly to every individual, but through persons chosen by God and enabled to speak his word reliably, including its written form . 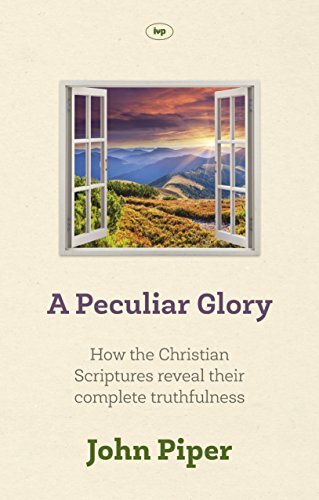 . . And as this collection of writings emerges, it would be handled with extraordinary care, because not only did the writings claim to be the word of God, but they also made explicit one of the clear implications of that fact, namely, their complete truthfulness” (Piper, p 96). or a son of man that he should change his mind. Or has he spoken, and will he not fulfill it? (Numbers 23:19). Jesus claimed to be the fulfillment of the Old Testament. Therefore, we are highly expectant as we ask, What was his estimate of these writings? We are asking, “Is the Bible the word of God—true and trustworthy and free from error?” Answering isn’t a simple process and sometimes not spine-tingling. But we’re wise to endure it, because haven’t you sometimes asked the question? Maybe when its teaching is radically counter-cultural. Or when you’re suffering and God’s promises seem a fantasy. This study isn’t meant to answer every question. But it’s meant to offer a preponderance of evidence on which to ground our faith. This evidence—the claims the Old Testament makes for itself—is a big chunk toward that end. God inspired the very words the biblical authors wrote. This wasn’t dictation. “Men spoke from God (using their own personalities and styles) as they were carried along by the Holy Spirit” (2 Peter 1:21). Do we have those very words—the original Hebrew and Greek words–of the biblical authors? After his resurrection, Jesus rebuked Peter: “’If it is my will that [John] remains until I come, what is that to you [Peter]? You follow me.’ Because of this, the rumor spread among the brothers that [John] would not die. But Jesus did not say that he would not die; he only said, ‘If I want him to remain alive until I return, what is that to you? '” (John 21-23). Right words were important to Jesus and John, as the familiar passage below confirms . . .
“Do not think that I have come to abolish the Law or the Prophets; I have not come to abolish them but to fulfill them. I tell you the truth, until heaven and earth disappear, not the smallest letter, not the least stroke of a pen, will by any means disappear from the Law until everything is accomplished” (Matthew 5:17,18). Peter warns against those who distort Paul’s words . . .
“[Paul] writes the same way in all his letters, speaking in them of these matters. His letters contain some things that are hard to understand, which ignorant and unstable people distort, as they do the other Scriptures, to their own destruction. Therefore, dear friends, since you already know this, be on your guard so that you may not be carried away by the error of lawless men and fall from your secure position” (2 Peter 3:16,17). Peter is saying getting the very words of Scripture right is important. Paul used an ”amanuensis” (a kind of secretary) to write one or many of his letters. However, he often took up the pen to assure his readers the words were his . . .
“I, Paul, write this greeting in my own hand, which is the distinguishing mark in all my letters. This is how I write” (2 Thessalonians 3:17). “[Paul] was eager not only that his readers have his very words but that they know they have them” (Piper, p. 73). Not only are prophets divinely inspired, so are words . . .
Paul was referring to the Old Testament, since at that time there was no New. Paul claims his own writings—the very words–to be Holy-Spirit-inspired . . .
“We have not received the spirit of the world but the Spirit who is from God, that we may understand what God has freely given us. This is what we speak, not in words taught us by human wisdom but in words taught by the Spirit, expressing spiritual truths in spiritual words” (1 Corinthians 2:12,13). DOES IT MAKE SENSE TO AFFIRM THE INERRANCY OF MANUSCRIPTS WE DON’T HAVE? We don’t have the original manuscripts the New Testament authors wrote. Hence, the question. Piper illustrates the answer. Suppose he writes you a letter (on paper) with directions to his house for an important meeting he wants you and others to attend. You scan his letter to make copies on two different days. But the scanner copies incorrectly on the second day. The original letter is lost. When guests compare letters they realize the error. “Now everyone getting to the meeting depended on the firm belief that the original letter was accurate and that every effort to get back to that wording was crucial—even though the original letter no long existed. Similarly, if the wording of Scripture in the original manuscripts is not affirmed as inerrant, there would be little incentive to try to get back as close as possible in our text-critical studies, which form the basis for all of our translations” (Piper, p. 78). “Our Greek and Hebrew versions and our translations are inerrant to the degree that they faithfully render the divine meaning carried by the inspired human words of the original manuscripts” (Piper, p. 78). This historical reality is an objective standard that we can approach through textual criticism. Without this conviction, today’s versions and translation are awash in subjectivism. Recently, most attacks on the Christian faith have come in textual criticism. But Piper writes, “I am convinced that in the end none of us settles the issue of biblical authority decisively on the basis of historical arguments . . . 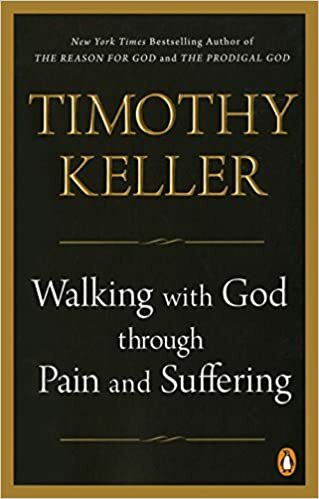 I will argue in the coming chapters how ordinary people with little chance of following complex and obscure textual arguments may discern whether the Christian Scriptures are the word of God” (p. 79, 80). Piper’s story comes from graduate school at the University of Munich where he did his doctrinal studies. I’ll skip the story for space. Conclusion: many mainline scholars are assured that text-critics have provided us with reliable Hebrew and Greek texts that we use today. We have about 5800 Greek New Testament manuscripts (no originals—copies). You can see many at http://www.csntm.org/Manuscripts.aspx. This is far more than any other ancient documents. For example, “The average classical author’s literary remains number no more than twenty copies. We have more than 1,000 times the manuscript data for the New Testament than we do for the average Greco-Roman author. Not only this, but the extant (surviving) manuscripts of the average classical author are no earlier than 500 years after the time he wrote. For the New Testament, we are waiting mere decades for surviving copies” (Daniel Wallace, regarded as “evangelical Christianity’s premier active textual critic today; Piper, p. 81). “No other ancient book comes close to the kind of wealth of diverse preservation that we have for the New Testament” (Piper, p.82). DO WE HAVE ACCESS TO WHAT WAS ORIGINALLY WRITTEN? D.A. Carson (Research Professor of New Testament at Trinity Evangelical Divinity School) summarizes: “What is at stake is a purity of text of such a substantial nature that nothing we believe to be doctrinally true, and nothing we are commanded to do, is in any way jeopardized by the variants” (Piper, p. 82). Muslims claim the New Testament presents a supernatural-Son-of-God Jesus who died for our sins and was raised because Christians changed original writings. “But there is no evidence that such writings existed, which means that the Muslim claim is an inference based on Mohammed’s view of Jesus” (Piper, p 83). This chapter’s aim has been to show that our Greek and Hebrew Scriptures are essentially the same as the ones written by the original authors. Dry, I know. Congratulations for plowing through! What does it all mean? The Bible (leather ones, especially) looks holy. But we need more than that to trust it. This chapter offers one reason. A book written over 1500 years, the last “book” of it 1900 years ago. No originals remain. But the discoveries and studies Piper mentions in chapter 4 assure us we hold what the original authors wrote. That means we can say, “The Bible says . . . ” with confidence that this is the very Word of God. When Jesus was born, the Hebrew Scriptures held supreme authority over Jewish lives and was a closed canon. There was no New Testament. “What opened the way to a new canon of authoritative writings was not the arrival of new spokesmen for God . . . but rather the arrival of God himself” (Piper, p. 52,53). Jesus’ staggering self-claims created a new authority that reached beyond the Hebrew Bible. In the Sermon On the Mount, for example, Jesus claimed to be the judge of the universe . . .
“Not everyone who says to me, ‘Lord, Lord,’ will enter the kingdom of heaven, but only he who does the will of my Father who is in heaven. Many will say to me on that day, ‘Lord, Lord, did we not prophesy in your name, and in your name drive out demons and perform many miracles?’ Then I will tell them plainly, ‘I never knew you. Away from me, you evildoers! '” (Matthew 7:21-23). Again in the Sermon On the Mount, Jesus explained he’d come not to confirm the Hebrew Scriptures, but to fulfill them (Matthew 5:17). “The point is that the divine majesty of the person of Jesus is woven inseparably into every layer of the teachings of Jesus. There is no portrait of Jesus in the New Testament as a merely human teacher of ethics. There is only the Lord of glory. The fulfiller of history. The judge of the universe” (Piper, p. 55). As a result, the early church recognized Jesus as having authority equal to and beyond the Hebrew Scriptures. The person and teaching of Jesus, therefore, led inevitably to the canon’s expansion. Centuries being governed by their Scriptures, now they’re confronted by the Author. His glory created a new canon. Jesus prepared the church for a new canon by which he would govern the church after he was gone. He’d provide for it through authoritative “apostles” whom he promised to guide by the Holy Spirit. They, in turn, would become the foundation of a new Israel. “These things I have spoken to you while I am still with you. But the Helper, the Holy Spirit, whom the Father will send in my name, he will teach you all things and bring to your remembrance all that I have said to you” (John 14:25,26). “The promise that the Holy Spirit would reveal the glory of Christ alerts us to the way Scriptures would be confirmed in the life of the early church. The light of that glory would shine through the inspired word into the hearts of God’s people and verify the divine origin and character of the Scriptures” (Piper. p. 59). Paul, not one of the Twelve (though he authored 13 of the New Testament’s 27 books), claimed to be an apostle “through Jesus Christ and God the Father, who raised him from the dead” (Galatians 1:1). After some hesitation, the Twelve accepted him as genuine (Galatians 2:7-9). Paul’s claim of authority was rooted in his seeing the actual risen Jesus, who commissioned him as an apostle (Acts 9:1-19). Consequently, he claimed to be inspired by the Spirit in fulfillment of Jesus’ promise . . .
“Now we have received not the spirit of the world, but the Spirit who is from God, that we might understand the things freely given us by God. And we impart this in words not taught by human wisdom but taught by the Spirit, interpreting spiritual truths to those who are spiritual” (1 Corinthians 2:12,13). “The risen Christ was continuing to shepherd his flock through the mouth of the apostles. He would provide a foundation for the church through their writings so that a canon of writings would emerge that would have the authority of the Lord Jesus till he comes again” (Piper, p. 63). Without canceling its truth, the New Testament completed the Old. Already the writings of the apostles were considered equal in authority with God’s inspired Old Testament writings. For example, here’s Peter’s comment . . .
“[Paul wrote to you] as he does in all his letters when he speaks in them of these matters. There are some things in them that are hard to understand, which the ignorant and unstable twist to their own destruction, as they do the other Scriptures” (2 Peter 3:16). Many writings existed. Which were “inspired”? The key, of course, was which were genuinely apostolic? Piper writes, ” . . . apostolicity . . . probably means more than ‘written in close association with an apostle.’ What the apostles possessed from the risen Christ through the Holy Spirit was a supernatural spiritual wisdom both to understand things incomprehensible to the ‘natural man’ and to teach them in words ‘taught by the Spirit'” (see 1 Corinthians 2:11-13). Apostolicity is “the supernatural transmission of naturally incomprehensible reality to spiritually discerning people” (Piper, p. 64). What was involved was not purely historical process or ecclesiastical selection; but “the process of canonization was governed by the spiritual and supernatural reality of the books and by the spiritual discernment of the church . . . The New Testament books were considered authoritative not because the church declared them to be so, or even because they were written directly by an apostle, but because they were understood to bear the essential apostolic deposit” (Piper, p. 65). The list of books considered authoritative: Matthew (apostle), Mark (Peter’s interpreter and assistant); Luke & Acts (close associate and partner of Paul); John (apostle); Thirteen letters of Paul (apostle); Hebrews (from Paul’s circles of associates); James (Jesus’ brother closely associated with the original Twelve); 1 & 2 Peter (apostle); 1,2, & 3 John (apostle); Jude (brother of Jesus and James); Revelation (John the apostle). Jesus was God in the flesh. He confirmed, fulfilled and superseded Old Testament authority. The New Testament grew organically out of that new authority in the world. He sent his Spirit to assure that the apostles would be led into all truth. They would speak from that authority and the manifestation of his glory would confirm to the church–then and today–that these writings are God’s words. Piper’s presentation is compelling. Not only does the New Testament’s authenticity stand on the glory of Jesus Christ. The Spirit also bears witness with my spirit (Romans 8:17) that the the New Testament is true and trustworthy. We can be assured we hold in our hands the New Testament books the early church held as manifesting the very glory of God in Christ by the Holy Spirit. “The Bible says . . . ” So goes our authoritative, argument-settling assertion. But is it? 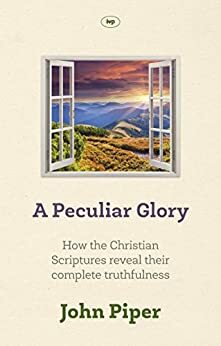 John Piper, founder and teacher of desiringGod.org and chancellor of Bethlehem College & Seminary in Minneapolis, Minnesota, asks in his book, A Peculiar Glory, “Is the Bible completely true? Is it so trustworthy in all that it teaches that it can function as the test of all other claims to truth?” (p. 11). Piper’s approach is unique. Many books on the subject approach the topic like a defense lawyer. I just googled “books on the inerrancy of Scripture and found among them two books with the same title–Defending Inerrancy. Piper, on the other hand, writes, “My seven decades of experience with the Bible have not been mainly a battle to hold on. They have been a blessing of being held on to, namely, by beauty–that is, by glory” (p. 11). ” . . . the Bible has not been for me like a masterpiece hanging on the wall of an Alpine chalet but rather like a window in the wall of the chalet, with the Alps on the other side” (p. 18) . . . “I am a captive of the glory of God revealed in Scripture” (p. 11). This book is also available free for online reading at . . . In the Introduction, Piper argues that God’s glory is the ground of both faith and knowledge. First, it teaches us all that God exists and is to be thanked . . . The wrath of God is being revealed from heaven against all the godlessness and wickedness of men who suppress the truth by their wickedness, since what may be known about God is plain to them, because God has made it plain to them. For since the creation of the world God’s invisible qualities– his eternal power and divine nature– have been clearly seen, being understood from what has been made, so that men are without excuse. For although they knew God, they neither glorified him as God nor gave thanks to him, but their thinking became futile and their foolish hearts were darkened (Romans 1:18-21). Second, glory is how Jesus’ first followers knew he was the Messiah . . .
Third, glory is how people know the gospel is from God . . . The god of this age has blinded the minds of unbelievers, so that they cannot see the light of the gospel of the glory of Christ, who is the image of God . . . For God, who said, “Let light shine out of darkness,” made his light shine in our hearts to give us the light of the knowledge of the glory of God in the face of Christ (2 Cor 4:4,6). And fourth, glory is how we know the Scriptures are God’s word. This is what Piper’s book is about. Toward that end, Piper divides his book into five main parts . . .
.Part Two: What Books and Words Make Up the Christian Scriptures? .Part Three: What Do the Christian Scriptures Claim for Themselves? .Part Four: How Can We Know the Christian Scriptures Are True? .Part Five: How Are the Christian Scriptures Confirmed by the Peculiar Glory of God? 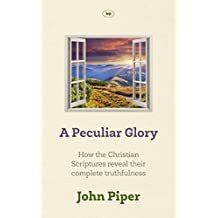 “My argument,” writes Piper, “is that the glory of God in and through the Scriptures is a real, objective, self-authenticating reality” (p. 15). Interesting argument, especially since many books arguing for the truth of Scripture become dry, weighty theological tomes guaranteed to get you yawning by page 3. Of A Peculiar Glory, on the other hand, the publisher writes . . .
Over the next few months, I’ll summarize Piper’s book. I hope you’ll make time to read. I know of no other topic more important to Christians who look to the Bible for authoritative truth. And I know of no better author to write about the glory the Bible contains.